LET US HELP YOU. Whatever the issue is that has you considering hiring an attorney, we know that there is nothing worse than feeling like you are taking on the world alone. At the Jackson Donley Law Offices, we consider ourselves partners with you in resolving your legal concerns, whatever they may be. From divorce and custody issues, personal injury claims, and immigrations concerns, to setting up a new business or providing for your family’s financial future, we will work diligently to represent you and bring you the best possible outcome. 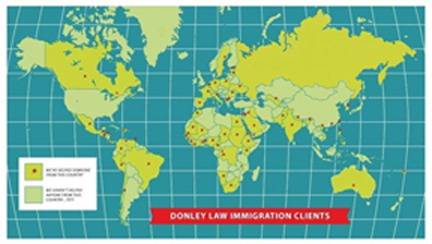 Since 2006, the Jackson Donley Law Offices has been committed to providing affordable, accessible, professional legal services. There is never a charge for the initial consultation, so we urge you to at least sit down with us to see if we can help. Jackson Donley, attorney, served for 21 years as a senior tax attorney for the State of Illinois. His focus for the state was on the revenue and collection side, so it was a natural transition for him to work on behalf of the citizens of Illinois to help them with bankruptcy and debt relief issues. In addition, he has years of experience and a great deal of expertise in the areas of Immigration and Naturalization, Estate Planning, Probate, Family Law, Business Law, Personal Injury, and Social Security/Disability. Mr. Donley’s commitment to his clients is apparent in the way he conducts business. He attempts to personally answer every phone call, and stays intimately involved with all of his clients’ cases.